Dr. Julien Levy earned his PhD in Plant Science (Molecular and Cellular Biology) at the University Paul Sabatier Toulouse III (INRA-LIPM) in France in 2003. 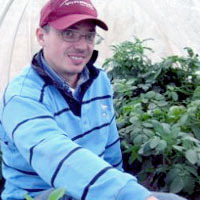 Since 2009, he has been a Post-Doctoral Research Associate in Texas A&M’s Department of Horticultural Sciences. A native French speaker, he has lived in the United States since 2005. His research is aimed at understanding the molecular mechanisms underlying the interactions between plants, microbes, and insects. To examine this, he employs plant breeding and traditional genetics with new technologies and molecular biology. He conducts both field and laboratory studies to improve food production and food security.